The IANDS 2014 Conference is now over but you can still view all the conference videos directly to your computer, as Video On Demand! See the full Video On Demand schedule -- featuring all of the main conference talks, at very reasonable prices. (Click on the links for each talk to get a description.) Access is available until January 1, 2015. 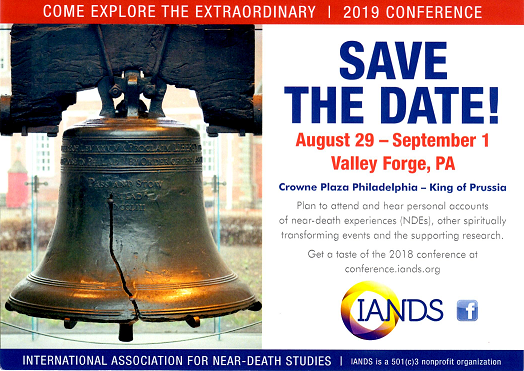 The two talks on Thursday, August 28 are FREE: NDE 101: Introduction to NDEs with Diane Corcoran and Debbie James and the Special Presentation by P.M.H. Atwater, so you can try out the conference videos, at no risk. You can buy the IANDS Full Conference Pass, or select a Full Day or specific Keynote Presentations. Simply (1) create a login to Streaming for the Soul, (2) select the Archives Tab - on the right - and scroll down to the bottom for IANDS, (3) select and 'Click to Purchase' the item -- or -- 'Click to Play', (4) the Video Player opens at the top of the screen.